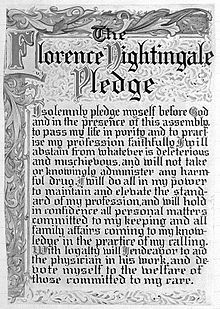 The Nightingale Pledge, named in honour of Florence Nightingale, is a modified version of the Hippocratic Oath. Lystra Gretter and a Committee for the Farrand Training School for Nurses in Detroit, Michigan, created the pledge in 1893. Gretter, inspired by the work of Nightingale, the founder of modern nursing, credited the pledge to the work of her committee, but was herself considered "the moving spirit behind the idea" for the pledge. The Nightingale Pledge is a statement of the ethics and principles of the nursing profession in the United States, and it is not used outside of the US. It included a vow to "abstain from whatever is deleterious and mischievous" and to "zealously seek to nurse those who are ill wherever they may be and whenever they are in need." In a 1935 revision to the pledge, Gretter widened the role of the nurse by including an oath to become a "missioner of health" dedicated to the advancement of "human welfare"—an expansion of nurses' bedside focus to an approach that encompassed public health. US nurses have recited the pledge at pinning ceremonies for decades. In recent years, many US nursing schools have made changes to the original or 1935 versions, often removing the "loyalty to physicians" phrasing to promote a more independent nursing profession, with its own particular ethical standards. "Practical Nurse Pledge", a modern version based on the "Nightingale Pledge"
I will not do anything evil or malicious and I will not knowingly give any harmful drug or assist in malpractice. I will not reveal any confidential information that may come to my knowledge in the course of my work. May my life be devoted to service and to the high ideals of the nursing profession. ^ a b c d Crathern, Alice Tarbell (1953). "For the Sick". In Detroit Courage Was the Fashion: The Contribution of Women to the Development of Detroit from 1701 to 1951. Wayne University Press. pp. 80–81. Retrieved March 5, 2013. ^ "Florence Nightingale Pledge". NursingWorld. American Nurses Association. Retrieved March 5, 2013. ^ Yates, David. "Lystra Eggert Gretter". The Truth About Nursing. Retrieved March 5, 2013. ^ Maxwell, Anna Caroline; Pope, Amy Elizabeth (1910). "The Florence Nightingale Pledge". Practical Nursing: A Text-book for Nurses and a Handbook for All who Care for the Sick. G.P. Putnam's Sons. p. 17. Retrieved March 5, 2013. ^ a b Basavanthappa, B. T. (January 1, 2003). Nursing Administration. Jaypee Brothers. p. viii. ISBN 8171796710. Retrieved March 5, 2013. This page was last edited on 27 December 2018, at 23:02 (UTC).